Soil erosion is a naturally occurring process that affects all landforms. 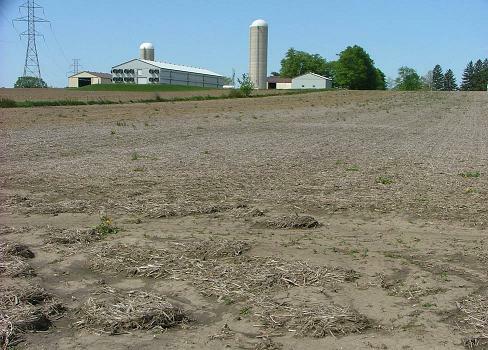 In agriculture, soil erosion refers to the wearing away of a field’s topsoil by the natural physical forces of water and wind or through forces associated with farming activities such as tillage. Erosion, whether it is by water, wind or tillage, involves three distinct actions – soil detachment, movement and deposition. Topsoil, which is high in organic matter, fertility and soil life, is relocated elsewhere “on-site” where it builds up over time or is carried “off-site” where it fills in drainage channels. Soil erosion reduces cropland productivity and contributes to the pollution of adjacent watercourses, wetlands and lakes. Soil erosion can be a slow process that continues relatively unnoticed or can occur at an alarming rate, causing serious loss of topsoil. Soil compaction, low organic matter, loss of soil structure, poor internal drainage, salinisation and soil acidity problems are other serious soil degradation conditions that can accelerate the soil erosion process. It has been estimated that an area of over 80 million hectares or about one-fourth of our total area is exposed to wind and water erosion out of which 40 million hectares of land has undergone serious erosion. Ironically the extent of soil erosion is increasing in spite of our efforts to check soil erosion. Experts have estimated that about 40,000 hectares of our land is permanently lost to cultivation and much larger area is rendered less productive every year due to wind and water erosion. About 21 million hectares are subject to severe wind erosion in Rajasthan and adjoining areas of Punjab, Haryana, and Gujarat. 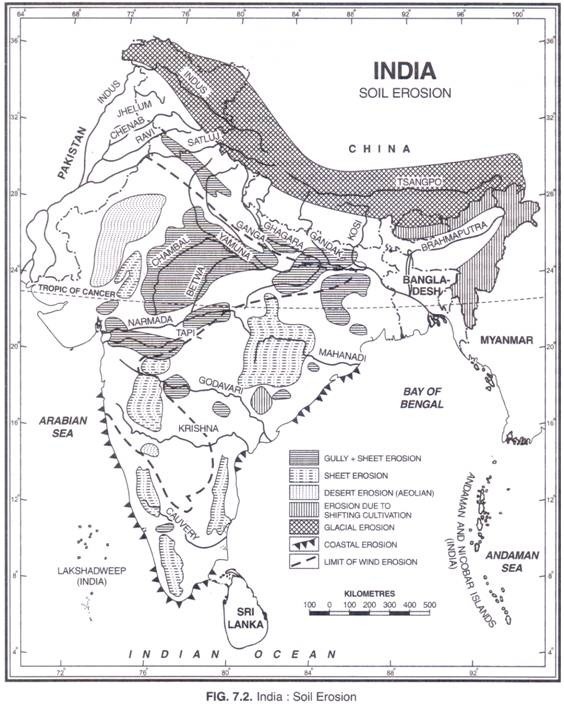 Wind erosion is a serious problem in arid and semi-arid parts of North West India. About 45 million hectares of land is subject to severe wind erosion in Rajasthan and adjoining areas of Punjab, Haryana, Gujarat and Western Uttar Pradesh . As such these areas are exposed to wind erosion. 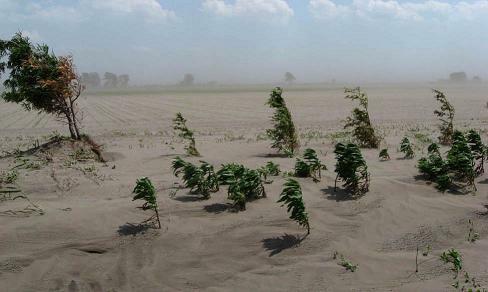 Faulty farming practices, failure to conserve moisture, lack of managing and over grazing make the problem of wind erosion more complicated. According to the latest estimates about 8 million tonnes of soil has been removed from every square kilometre area in desert during the last hundred years. In Timil Nadu, ravines are common in South Arcot, North Arcot, Kanniyakumari, Tiruchchirapalli, Chingleput, Salem and Coimbatore districts. In West Bengal numerous gullies and ravines exist in the upper catchment areas of the Kangsabati River in Purulia district. 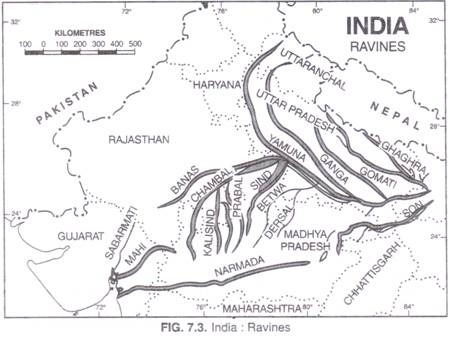 In Bihar, river courses of the Ganga, the Gandak, the Kosi and the Son are affected by ravines. The flood plains of the Ganga and its tributaries in Uttar Pradesh and Bihar also suffer from the problem of soil erosion caused by water. These rivers are carving deep furrows and removing fertile top soil. According to one estimate the Ganga River is transporting about 30 million tonnes of eroded material per year from the Ganga plain to the Bay of Bengal. Similarly the Brahmaputra is transporting about 10 million tonnes annually from the Brahmaputra valley to the Bay of Bengal. 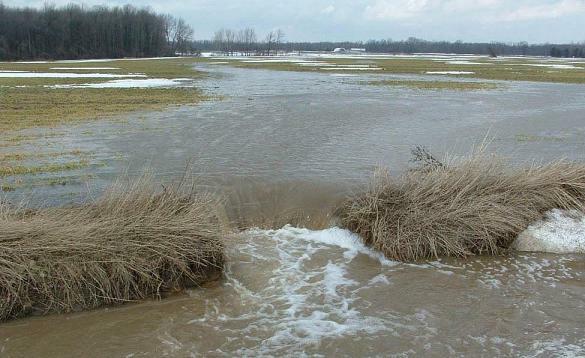 The widespread occurrence of water erosion combined with the severity of on-site and off-site impacts have made water erosion the focus of soil conservation efforts in Ontario. Sheet erosion is the movement of soil from raindrop splash and runoff water. It typically occurs evenly over a uniform slope and goes unnoticed until most of the productive topsoil has been lost. Deposition of the eroded soil occurs at the bottom of the slope or in low areas. Lighter-coloured soils on knolls, changes in soil horizon thickness and low crop yields on shoulder slopes and knolls are other indicators. Rill erosion results when surface water runoff concentrates, forming small yet well-defined channels. These distinct channels where the soil has been washed away are called rills when they are small enough to not interfere with field machinery operations. In many cases, rills are filled in each year as part of tillage operations. 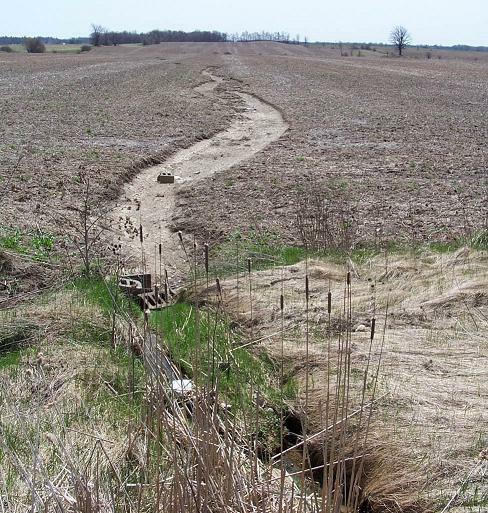 Gully erosion is an advanced stage of rill erosion where surface channels are eroded to the point where they become a nuisance factor in normal tillage operations. There are farms in Ontario that are losing large quantities of topsoil and subsoil each year due to gully erosion. Surface water runoff, causing gully formation or the enlarging of existing gullies, is usually the result of improper outlet design for local surface and subsurface drainage systems. The soil instability of gully banks, usually associated with seepage of groundwater, leads to sloughing and slumping (caving-in) of bank slopes. Such failures usually occur during spring months when the soil water conditions are most conducive to the problem. 1. 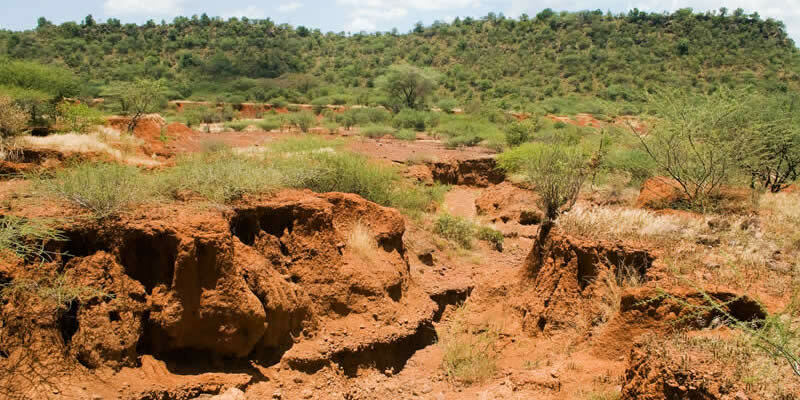 Top soil is eroded which leads to loss of soil fertility and fall in agricultural productivity. 2. Flooding and leaching result in loss of mineral nutrients. 3. Ground water level is lowered and there is decrease in soil moisture. 4. Natural vegetation cover dries up and arid lands expand. 5. Frequency and intensity of floods and drought increases. 6. Rivers, canals and tanks are silted and their water holding capacity decreases. 7. The incidence and damaging power of landslides increases. 8. Economy as whole suffers a great setback.